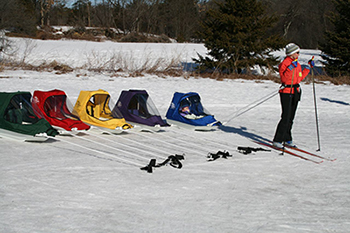 The huge inventory of ski equipment for rent at Great Brook includes skis, boots, and poles for all ages and sizes. The waxless touring skis can suit toddlers and all adults, and skating skis are also available. A fleet of comfortable Salomon Profil boots ranges in size from children's 9.5 (European size 27) to men's 14 (European size 50). Pulk Sled: Children too small to ski can be pulled by parents in this special sled. Protected from the elements and buckled with a 3-point safety harness, kids can safely sit (and sleep!) while you ski.